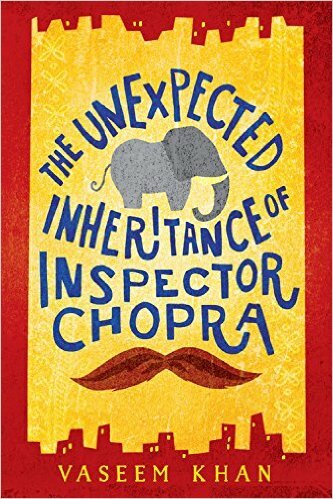 The Unexpected Inheritance of Inspector Chopra, by Vaseem Khan, begins with some classic elements of noir mysteries: a police inspector, on the last day before his retirement, comes across a case that looks straightforward, probably just an accidental death. He senses there is more to the death than first appears, and, despite his retirement and the complete lack of support from the officer who replaced him and the higher-ups in the force, he begins to dig into the circumstances of the death. As he does, he starts uncovering some pretty shady characters, crime bosses supposed to be dead, goons trying to kill him, corruption leading to the highest levels of society. Despite the dangers to himself, despite his lack of official authority, the retired inspector cannot let go of the case or the investigation until he learns the truth. Pretty standard, right? Except that in this book, the city in question is not New York or Chicago or Los Angeles, but Mumbai, India. And on the last day of Inspector Chopra’s tenure as an official police officer, he receives the oddest gift from his now deceased uncle: a live baby elephant whom he names Ganesha, after the Hindu deity. Nor, as it turns out, is Inspector Chopra your standard noir hero: he is neither an alcoholic nor cynical (perhaps he is a little less cynical than he should be, given the situation in which he finds himself), he is happily married and a well-connected member of his community. Not to mention the elephant. Ganesha, while still only a baby elephant, is a character in his own right, and Chopra has to figure out, first, why his uncle sent him this particular present when Chopra lives in a city and has no experience with elephants, and second, what he’s supposed to do with Ganesha. The little elephant doesn’t make matters easier at first, seeming almost depressed, refusing to eat, reluctant to move, and Chopra considers sending him to an elephant sanctuary on the other side of the country. However, Ganesha comes into his own and turns out to be quite a help to Chopra, in ways that are both mysterious and emotionally satisfying (you’ll root for Ganesha). The milieu of the book comes to brilliant life. You could almost smell the aromas of the different areas of Mumbai, feel the oppressive heat, from the author’s description, and you could hardly find a better, more patient and understanding guide to the intricacies of Indian policing and local politics than Inspector Chopra. His immediate environment, his issues with the landlady of the apartment complex in which he lives, his relationship with his wife (whom he loves but from whom he keeps some secrets) and his mother-in-law (who lives with them), all add dimensions to Chopra’s life and his investigation. This is not your ordinary mystery, though it has many of the classic elements (including serious danger to the protagonist, opposition from the powers that be, and a solution that reveals what actually happened to the victim, along with a form of justice done to the perpetrators). In style, it’s like an Indian version of Alexander McCall Smith’s No. 1 Ladies Detective Agency books (and there’s every reason to believe there will be sequels for Inspector Chopra and Ganesha, to which I say hooray!). The characters are well-developed and believable, the setting richly developed, and the plot very satisfying. Come and meet Chopra and his baby elephant, and settle in for a fun read.